This interview took place on: 4/11/05. Thanks to Lauren "The 4th BarlowGirl" Summerford for your help. Jesus freak Hideout (Amy DiBiase): Ok, first question. How did you get started? What led to you choosing this name? Becca Barlow: We were free, I think. Lauren Barlow: So we started doing that as our family ministry. We traveled around and did family services and stuff, and during that time us girls started writing songs just for fun, just for our friends or whatever. Alyssa Barlow: Or different things that we had seen in our journals. I'd read my journal, I'd bring my journal and be like, "I'm really struggling" (Lauren: Right.) "I'm really going through this issue and I feel like God is teaching me this." And we would just sit down for fun on a Friday night and just write a song about it or something. Lauren Barlow: And so during that time, it was about four years ago, where I had picked up the drums cause I had played keyboards before. And Alyssa picked up the bass, like, three years ago, and Becca started playing the guitar and it was just like, I don't know - we just looked at each other one day and went "Oh my gosh! We're a band." It just happened. Becca Barlow: It's our last name. Alyssa Barlow: It really worked. JFH (Amy): What have been your influences throughout developing your style and your sound? Anybody? Alyssa Barlow: Worship, oldies music, Beatles, Mamas and Papas. When we were raised, my dad was really into oldies music, like the Beatles and stuff. So those were our lullabies. So we know all the James Taylor, all the songs. (Amy: Wow!) We didn't really know '80s music existed. Our mom's like "'80s music!" and we were like "What?" I can't name you one song from the '80s. *laughs* Because it was so in our family, it was '50s and '60s. And, yeah, we eventually got into dc Talk and stuff like that but we don't listen to that much music. Lauren Barlow: Yeah, I know, we're kinda weird. Alyssa Barlow: We are kind of weird like that. JFH (Amy): That might have helped to have your own sound, then. Lauren Barlow: I'm just kidding! JFH (Amy): Do you feel challenged to evolve your sound or are you just going to try to see where God takes you and just go with it? Becca Barlow: I think the one thing we struggled with was what did God teach us in the last year? And what do we need to sing about that we learned in this past year? So it just meant going back through our journals, going "What did You show us in the past year? What is on our hearts from this year?" Cause the last record, you have your whole life to write those songs, your whole life of struggles to write those songs. So it was one year. Lauren Barlow: But I don't think we felt the pressure to, I don't know... it just happened. Our sound did definitely mature, but I don't think it was because we tried to mature it. I think it was just… I think in a sense we have matured since the stuff we wrote last time. Alyssa Barlow: It was a sigh of relief, and we were so stressing out about it. But it was another way that God was like "I told you I'd take care of you. This is your calling. I'm going to take care of you and you're going to have the tools you need to minister again and again until I say done." Becca Barlow: Well, we have "Psalm 73." Alyssa Barlow: And that's a huge one for us. Becca Barlow: The one song we constantly have on our hearts, the song that's based off of Psalm 73. Which basically the whole song talks about how good the world looks but the verse turns around at the end and Asaph then realized this is worth nothing, the world is worth nothing. "Who have I in Heaven but You?" He's talking to God. Becca Barlow: It's supposed to be a secret. Lauren Barlow: No it's not! Alyssa Barlow: Yes it is! JFH (Amy): It's probably very appropriate for the theme. Becca Barlow: Oh yeah, it was! It was cool because we had been praying "Ok God, do You want anybody to help us out on this record?" and we felt like we needed to add Todd in. At the same exact time he was studying the same verse. So that's amazing. Alyssa Barlow: God had been teaching him that, and he goes "I'm in! God's teaching me this. It's so weird." That was cool. Very, very cool. JFH (Amy): Wow that's awesome. What's the hardest part about touring, since you're siblings and all? What are some of the challenges you face with that? Lauren Barlow: I think the hardest thing with touring - just touring - is being away. We have a brother and we're really close to him. We're just as close to our brother as we are. He and his wife have two kids, so we're aunts! They live back home in Chicago and that part just kills us because we don't see them for months at a time. That's just murder for us. Becca Barlow: We try to call every week and we just cry. Alyssa Barlow: The kids will get on the phone and they're always (Becca: "Where are you? Where are you?") They always say in their words "Can I come rock 'n' roll with you now, please?" It's like, oh, it kills me! Lauren Barlow: So that's hard, but I think as a family it's almost easier because we're all together. Mom and Dad do come with us too, so that part is really amazing that we do have that support team. But of course, we will always get in our little family disputes. Alyssa Barlow: Yeah, but then at the same time you're a lot less homesick cause every single morning I've got my sisters and my parents with me. They're totally my best friends - my sisters are, so it makes it a lot easier to be like "We can do another day" cause we're together. I've found it's made it a lot easier. JFH (Amy): If you where home, would that be where your brother is? Becca Barlow: Yeah! He's a mile from our house! JFH (Amy): So when you go home, you go to his house? Becca Barlow: Oh yeah! We, like, live at his house! Alyssa Barlow: We totally do! "Ok we're coming. We're driving into town and we're coming to your house!" Lauren Barlow: We don't even go home first, we always go to his house. *laughs* Then we pick up the kids and steal them for like a week! They're amazing! They're so cute! JFH (Amy): How old are they? Becca Barlow: Caleb is two and a half and Emma is… (Lauren: She just turned one.) We missed her birthday. Lauren Barlow: So she just lays on the phone and listens to us talk to her. Alyssa Barlow: And she tries to say "I love you." (Lauren: She says "I lo chu"…) "I lo chu, I lo chu"
Lauren Barlow: I just choke! Becca Barlow: It's like sneezing or something. Lauren Barlow: It's so cute! I love her. She's amazing! Lauren Barlow: We're girls! We like it. 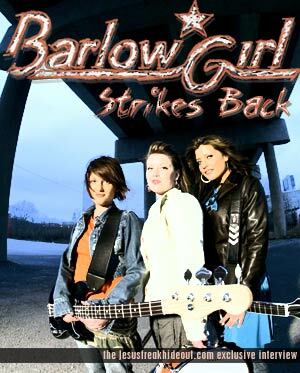 JFH (Amy): Do you guys have any connection with the Barlowgirl.net website? Do fans confuse it with your site? Becca Barlow: They definitely do confuse it, that does happen. Lauren Barlow: The girl who started it… (Alyssa: We got to meet her.) She did start it because of the Superchic[k] song. Then she contacted us, I think before she started the site or while she was starting it. Alyssa Barlow: She found out we existed. She thought the Superchic[k] song was just about pretend girls, kind of what everybody thought. So when we started to come out more and get signed and stuff, she thought "Oh no! I'm going to be in such big trouble. These girls exist and I'm using their domain name." So she called us and we were like "You know what, we've been to your site," and we love what she stands for and we love the community, so we said "It's fine. Go ahead and use it." So we talk with her a lot. It's cool. Fans do confuse it though. She tries to post things everywhere like "This is not the BarlowGirl's site," but it's still confusing. JFH (Amy): Was your father an instrumental role in the development of your musical careers? Did he help you find what each one of you guys was talented with as far as instruments and voice arrangements? Becca Barlow: Oh yeah! Dad was a musician, so we grew up going with him to his gigs and watching him play. Alyssa Barlow: First, they made us all play piano. We didn't have a choice, even if we didn't want to do it. It was good though. Becca Barlow: When we were younger, Mom and Dad would go to garage sales. We hardly had any money, but they would buy a dollar guitar. We had a music room growing up. (Alyssa: Instruments all over.) We didn't take lessons in these things but they were always like "Try out these instruments." Dad would always pull out his guitar and just play it and we would sing. As we got older, he would always challenge us and be like "I want you to do this." I hate being on stage. God's really having to do work in me. When I was 17, Dad was like, "I need you to play in our band at church" and I was like *gasp* "Nooo!" He was just like "Stand in the back. You'll be fine. Then after he talked me into it, he would coach me like "You could stand in the back. You'll be fine." He was huge in me even being on stage. I would never have done it if it wasn't for him. Alyssa Barlow: He was the one who even challenged me to play bass, cause I had only done keyboard, even in the first year and a half of the band. He's like "I really think you should try the bass thing. It'll be fine." (Becca: We were a four-piece band.) "You know piano, and you can try it." I was like "I don't know," but, yeah, it was the same thing. Lauren Barlow: I picked up the drums, just picked them up one day. On accident, I guess. Just cause it was fun. Alyssa Barlow: Mom and Dad loved it, that we played instruments. They've always encouraged us to do that, and once we learned piano they said we were allowed to teach ourselves anything else after that. So, everything else after that is self-taught but piano was the one that they paid for the lessons. JFH (Amy): So you guys didn't take paid lessons for your other instruments? Lauren Barlow: No, we're self-taught. Becca Barlow: You know the fundamentals. Lauren Barlow: You can read music. Alyssa Barlow: Even with drums, she [Lauren] was able to teach herself drums because of knowing the piano. JFH (Amy): Do you have lots of guy fans in the audiences? I don't mean guy fans sappy over you, I mean guy fans who get encouraged over your music. Or is it mostly girls with the themes you carry? Do you feel like you have to cater to the guys to make them feel welcomed to your shows? Alyssa Barlow: Guys are a little bit hesitant to come to the shows at first. Becca Barlow: Guys are usually like, "I only came on a bet…"
Lauren Barlow: "Because you [girls] are absolutely horrible and you couldn't do anything…"
Lauren Barlow: I don't really feel like we have to cater to guys. Alyssa Barlow: There were hardly any girls, we look out into the audience and there were a couple hundred guys. Guys over there are like with rock music, "A girl band? Yes!" They're more excited, so over in Europe we get a lot more guys. Here, the guys took a little bit longer, but now I say it's pretty even. Becca Barlow: But thematically, like our themes, what we speak on is basically Romans 12:2. So what we try to speak on, what we talk about is applicable to everyone, I think. Alyssa Barlow: Even with the modesty issue, we still get a lot of guys, even though it's an issue we're aiming at girls, guys still come and go, "Well, that helps me out that you're writing that song." So it has been pretty good. JFH (Amy): [To Alyssa] I read about an accident that you had that led to medical issues. I didn't know if you felt comfortable talking about that. The thing I'm most interested in is the healing you went through. Lauren Barlow: Plus you were a dancer. Alyssa Barlow: Yeah, I was a dancer. I was in theatre. So my life was kind of over at that point. (Amy: You wanted to do Broadway?) Yes! That was when God said, "Not Broadway!" *laughs* "I have something else for you." It was I was in bed, laying there, He said, "It's not Broadway. It's going to be something else." That's what led to this.